You can find this under: Schedula Profile > Manage Your Profile > Active Memberships. First check that they’re registered in the current season as a match official in your SportsTG database. For AFL users check that they aren’t listed in the ‘pending registrations’. Can we use Schedula for practice games? Yes, you should create a new competition for this in your SportsTG database. Make sure that you edit the practise game and click ‘Hide in Stats’ so the game doesn’t contribute to player career stats. Our officials aren’t receiving their appointment notifications. Why is this? Confirm that the emails are not going to their spam folder. How do I unlock a fixture? 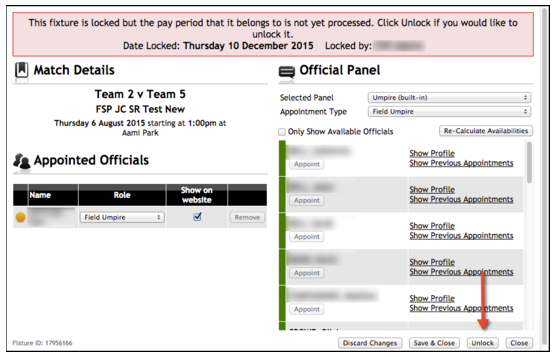 To unlock a fixture, simply hit 'Unlock' on the bottom right of your screen. How can I edit the dates on existing unprocessed pay periods? 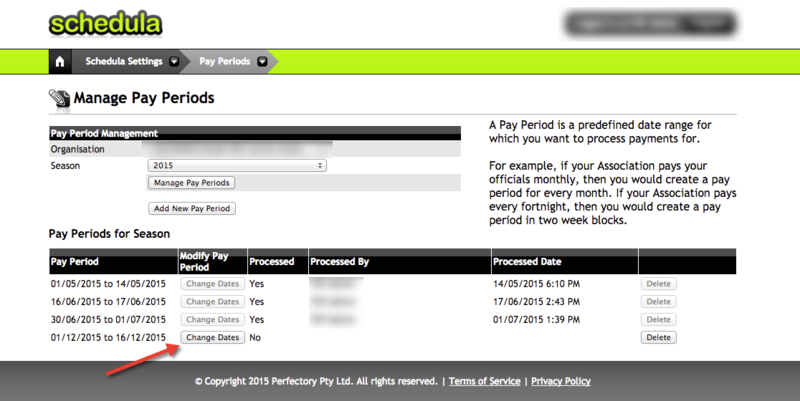 Click change Date, just to the left of the Pay Period dates. I cannot Login or reset my password for Schedula - what should I do? SportsTG support will need to do this for you. Please contact us here: http://support.sportingpulse.com/help/contact-us with your contact information. An error message is telling a member my email address is already in use - what should I do? This means that the member is a duplicate. SportsTG support will need to merge the member's record. To do this please contact us here: http://support.sportingpulse.com/help/contact-us with the member's details. On the pay advice, it states 'Make sure your bank account details are up to date in Schedula.’​ How do I add the bank account details? Please check out this article - Adding Bank Account Details. This article provides instructions on how to add your bank account details. I have renewed my membership for 2016 but Schedula will not update, (24 hours later) still saying it has expired. I am unable to receive my appointments. This will have occurred because you did not select a member type, eg. Umpire. Once selected, this will then copy to Schedula within the hour.